2 Days until the Barrie Colts 2018-19 Home Opener! (Tyler Tucker) #OHL - Very Barrie Colts | A website covering the Barrie Colts of the OHL. 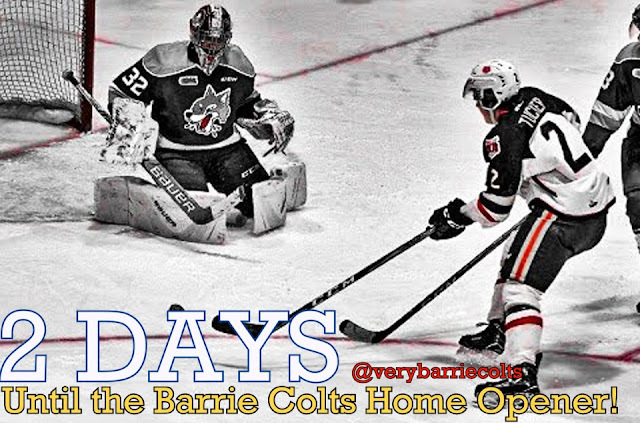 There are 2 days until the Barrie Colts 2018-19 home opener! Tyler Tucker currently wears 2 with the Barrie Colts. Tucker was drafted 16th overall by the Barrie Colts at the 2016 OHL Priority Selection Draft. He made his debut with Barrie during the 2016-17 season where he scored a goal and added 13 assists. Tucker showed huge progress in his following season, despite missing the first 6 games of the season for a hit against Owen Sound in the pre-season. Though, he missed the start of the season, it didn't stop him from having an impressive sophomore year with Ponies putting up 3 goals and 20 assists. Tucker was even more impressive in the post-season where he put up 3 goals and 3 assists over 12 games. Tyler was drafted by the St.Louis Blues 200th overall at the 2018 NHL Draft. He impressed management at camp with his physicality. Tucker even got into a fight with Rangers prospect Derek Pratt who is 24 years old. A lot of guts for the 18 year old to not only get into the scrap but also hold his own. Tucker has looked great in the pre-season, getting a goal and an assist through 4 games. He has looked to have improved his conditioning and has improved his skating since last season. Tucker is poised to have the best season of his OHL career and will be a huge part of an already strong defencive group in Barrie.